In recent weeks, MOE has announced significant budget cuts for several independent schools and a slew of restrictions on expenditures, prompting parliamentary questions and public debate. Concerned citizens have criticised the cutbacks in air-con use, the restrictions on building new facilities, and the limitations on alumni donations, noting that they hurt independent schools without benefitting government-funded ones. Others have lambasted the perceived opulence of the top schools. But the most pressing issues aren’t philosophical ones. These budget cuts will have a massive practical impact on the affected schools, which include RI. What, from a three percent reduction, at worst? But we should not be complacent. Consider that an overwhelming portion of the school budget has to go towards non-negotiable expenditures, such as staff wages, utility fees, and maintenance costs. If we assume, optimistically, that discretionary spending is about one-third of the total budget, a three percent reduction would mean a 10% cut to items like funding for CCAs or enrichment programmes. Suddenly, the picture seems a lot bleaker. In addition, MOE’s figures are calculated to account for ‘total resourcing’ – which means that the real cuts to government expenditure on independent schools like RI are much deeper, possibly along the scale of over a million dollars a year. This is a crucial distinction, because the 1823 Fund is mainly used for bursaries and community service projects, not CCAs or enrichment activities, so a reduction in government funding cannot be entirely mitigated by alumni donations. In other words, an apparently innocuous three percent budget cut could have serious implications for the very programmes that are closest to our hearts. We have every reason to be concerned. Some Rafflesians, however, remain dismissive. Surely it is unfair to pass judgement about the budget cuts when we don’t even know their effects? But it will simply be too late to respond when we do. 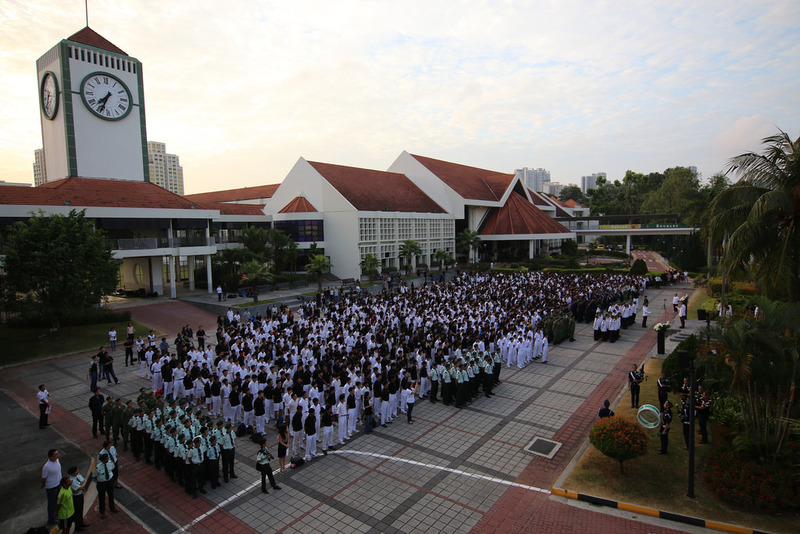 Principal Mr Chan Poh Meng has stated that the budget cuts are ‘an opportunity for us to relook everything’. With such a grand commitment, the school administration will presumably and understandably be reluctant to relook everything again after it has rebalanced its budget. The appropriate moment to provide student feedback, then, would be when the administration is in the process of reevaluating its priorities – that is, now. CCA funding tops the list of student concerns. That’s unsurprising, given that budget cuts in this area will affect literally every student in the school, with potential effects ranging from fewer overseas trips to less coaching. Smaller CCAs in particular could be crippled by budget reductions. The current chairman of HISSOC, Darren Teoh, reflected that HISSOC cannot run with a smaller budget, and that the CCA already has to source for external funding to sustain itself. Thus, if the school absolutely must reduce CCA funding, it should review the budgets of larger CCAs and examine if there are any excesses, instead of unwittingly threatening less established CCAs with extinction. Similarly, the school could reconsider potential cuts to funding for enrichment activities. This refers both to enrichment programmes like RP3 or ISLE, and activities such as class camps or overseas cultural trips. Such activities, after all, provide students with an invaluable opportunity to broaden their horizons beyond the confinements of the classroom. Jian Hui from 14S03F hence opined that enrichment activities should not be scaled down, as students would then lose the opportunity to expand their learning. Jin Jie from 14S07B furthermore pointed out that students from lower-income households could be disproportionally affected if the budget cuts extend to financial aid for such programmes and overseas trips. While RI may ultimately have no choice but to largely restrict overseas programmes to Asia, it would be unfortunate if students lose the opportunity to gain global exposure. Conversely, despite the disproportionate focus on air-con cutbacks in the mainstream media, students seem confident in their ability to withstand the heat. Adriel Ang from 15S03D moreover supports reductions in air-con use, observing that the air-con had been left on for long periods of time after lessons at the Year 1-4 campus. This flippant wastage suggests, worryingly, that some Rafflesians have taken the school’s facilities for granted. On the other hand, one should pause before doing away with air-conditioning entirely, since the classrooms are not designed with ventilation in mind. A notable example is the curious presence of large metal sheets outside the windows of certain classrooms, which block any wisps of wind. Nevertheless, it is clearly unreasonable to expect everything to go on as before with a shrinking budget. It would be highly desirable however, if the school left funding for CCAs and enrichment activities untouched, and focused on feel-good events that have little tangible benefit for students. Jian Hui cites Take 5 as a prime example. Yes, it may be immensely fun, but does the school really need to spend thousands of dollars on monorail tickets? To go even further, does it really need to book an entire beach? Darren also feels that education should always be prioritised over school tradition or celebrations. It would be quite ironic, for instance, if the school commemorated the handover of CCA leadership with flowers and fanfare while students wonder if their CCAs would survive till the next Prometheum Day. In the end, no matter what direction the school takes, the greatest mistake we can make is to be apathetic. Even as we are challenged to respond to wider questions of equity in society, we should not forget that we also have to respond to practical questions in our own backyard as a school community.